Academician Mikhail Mikhaylovich Lavrentyev is a great Russian scientist-mathematician, an organizer of the Siberian science and a public figure, a winner of Lenin and State premiums. M.M.Lavrentyev was born on July 21, 1932 in Moscow. The beginning of his scientific way is associated to M.V.Lomonosov Moscow State University. In 1950, he entered mechanico-mathematical faculty of the university, and in 1955, the postgraduate study of the university, to academician S.L.Sobolev. His first scientific works were published in 1953-1954. During 1955-1957 M.M.Lavrentyev published a cycle of works that centers around the inverse problem of the potential theory and Cauchy problem for elliptical equations, on the basis of which he protected his PhD thesis in 1957. All further scientific and pedagogical activity of M.M.Lavrentyev occurred in Siberia. Being a son and an associate of academician Mikhail Alekseevich Lavrentyev, an outstanding mathematician and mechanic, the founder and the first Chairman of the Siberian Branch of RAS, he was among the Siberian Branch 'pathfinders'. He arrived to Siberia together with his father soon after the decision of the USSR Council of ministers «About the creation of the Siberian Branch of Academy of Sciences» of 1957. While working in the Institute of Mathematics, ever since its formation in 1957, from the position of junior research assistant up to the Head of the Laboratory of Problems of Geology and Geophysics, he created there the basis of the theory of improperly posed problems that has reached world-wide recognition nowadays, and in 1961, he has protected a thesis for a doctor's degree. At the same time, M.M.Lavrentyev worked for defense subjects and got the Lenin Prize for the works in this field in 1962. In 1963, M.M.Lavrentyev, together with the laboratory, passes to the Computer Center of SB AS USSR and creates there a large department of mathematical problems of geophysics. 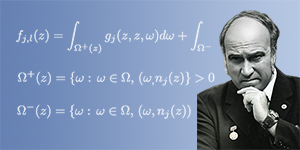 At this time M.M.Lavrentyev intensively develops a new field that is the theory and applications of many-dimensional inverse problems for differential equations. Working in close cooperation with scientists from the Institute of Geology and Geophysics, he formulates a wide spectrum of inverse problems that are related to geophysical applications. During the next years, these formed a basis for intensive research for his numerous disciples. In addition, he works as the deputy director on science of the Computer Center of AS USSR for six years (from 1980 to 1986). In 1968, M.M.Lavrentyev was elected a corresponding member of the Academy of Sciences of the USSR, and in 1981, its full member. In 1987, he was awarded with the State Premium of the USSR for a cycle of works on the theory of inverse and incorrect problems. The scientific and pedagogical activity of M.M.Lavrentyev has been pointed out by many other high awards too. From 1986 to 2002, M.M.Lavrentyev headed the S.L.Sobolev Institute of Mathematics of the Siberian Branch of RAS, and since 2002 he was an adviser of the Russian Academy of Sciences. Numerous theoretical studies of M.M.Lavrentyev are being widely applied in geophysics, mechanics, biology, ecology, and other sciences. A distinctive feature of his scholarly works is the a deep insight into the essence of an applied problem. He inherited a vital principle from the father: the adequacy of scientific computations and created models to the actual facts of the matter. His ideas in the field of the theory of inverse problems have created an absolutely new scientific avenue in mathematical physics. These ideas have been implemented in a diversity of applied projects. M.M.Lavrentyev created Siberian scientific school on inverse and incorrect problems that is world-wide recognized nowadays. He supervised over more than 100 protected PhD theses, and several dozen of his disciples became doctors of sciences. Likewise, M.M.Lavrentyev has significant merits in development of scholarly studies into inverse and incorrect problems abroad, particularly, in Italy, America, and Japan. He is the author of over hundred learned works that include eight monographs. Besides the research, M.M.Lavrentyev conducted permanently a great pedagogical and organizational work. Ever since the foundation of the Novosibirsk State University in 1959, he taught there, while working at the mechanics and mathematics faculty. He headed the sub-faculty of mathematical methods in geophysics, and then, the sub-faculty of functions theory. He was involved in academic councils of the University; he was the chairman of a specialized academic board in protecting doctoral and PhD theses, and he worked as the dean of the mechanics and mathematics faculty for seven years. M.M.Lavrentyev was the editor-in-chief of «Siberian Mathematical Journal», «Siberian Magazine of Industrial Mathematics», of the international «Journal of Inverse and Ill-Posed Problyems». He was in the editorial boards of some other mathematical journals. He was a member of the Presidium of the Siberian Branch of RAS for many years, the deputy of the academician-secretary of mathematics division of the Russian Academy of Sciences. Mikhail Mikhaylovich was distinguished by a widely outlook and an active position with his life. He demonstrated a vivid involvement to find solution for several major Russian problems that were vital for the wide public. We shall note only a few of them. It was common knowledge that there were Academies of Sciences in all republics of the Soviet Union, but no in RSFSR. In this relation, a social movement appeared in late 1980s for the creation of the Academy of Sciences in Russian Federation. M.M.Lavrentyev ranked among the principal organizers of this Academy that has been created in 1991, but due to the USSR liquidation, it got the name of not Russian, but the Peter Academy of Sciences and Arts. He was elected its full member, and then its vice-president, and since 1993 up to the last his days was a member of the Presidium of its Novosibirsk Subdivision. * Source: M.M.Lavryent'yev - vydayusciisya uchyenyi i organizator rossiiskoi nauki. K 80-lyetiyu so dnya rozhdyeniya / D.S.Anikonov, YU.S.Anikonov, S.I.Kabanikhin, V.G.Romanov, A.V.Sychyev // Nauka v Sibiri. - 2012. - N 28-29 (26 iyulya). - S.5. Updated: Wed Feb 27 14:46:36 2019. Size: 12,438 bytes.